Viking jewelry was worn by men & women as a sign of wealth and status. 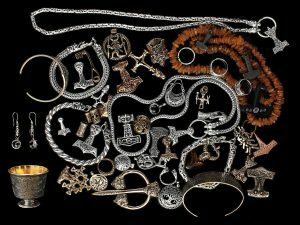 Examples of silver, bronze, iron & amber jewelry has been found at burial sites and in the remnants of Viking settlements all across Europe. One of the densest areas of discovery is the ancient trading post of Birka in Sweden and so many examples of today’s replicas are taken from finds from there and around Gotland. There are many sites in Sweden, Denmark, Norway, UK & Ireland where Viking hoards have been uncovered. The Vikings often traded in hack silver, where pieces of silver were hacked off parts of jewelry & coins and weighed to barter for other goods such as food, crops, cattle & even slaves. Bronze & silver appeared to be the most popular metals used to cast and design ornate pieces and a common feature among Viking jewelry was animal designs taken from nature & Norse mythology. Bronze brooches & beads were common among Viking women with rings & earrings being a rarity. The wealthy Vikings would wear bronze, silver and occasionally gold. The less wealthy would wear items of carved horn, bone & iron. As trade routes opened up then materials would appear, such as amber, carnelian and other precious stones. Our Viking jewelry / jewellery is handmade from either solid 925 sterling silver, bronze, hand-forged iron, polished horn, bone, glass, or natural amber. Each piece of our Viking jewelry is either a replica of an original Viking artifact, or has designs taken from an original Viking artifact. Due to the complexity of their form, each piece of silver or bronze Viking jewelry must be individually cast using a lost wax process, the same technique that was used by the ancient Viking smiths to produce their masterpieces. A wax master is used to create a mold for each item into which molten bronze or silver is poured. The mould is then destroyed in order to remove the casting and each individual piece of jewelry is then finished and polished by hand. The end result is simply the finest quality Viking jewelry you will ever see.